A young lady came to see me one day and she told me about how her fiancé does not trust her, she told me he would always check her text messages and even her chats and she told me she was tired. I’ve heard stories like this over time from other ladies and even the men. It reminds me of my growing up, I loved my brothers so much that I started having issues when they introduced me to their fiancées I felt they would move their attention from me to them and so the thought of that gets me pissed off. The truth is I can’t marry them so why was I angry? Then I realized I’ve been selfish. 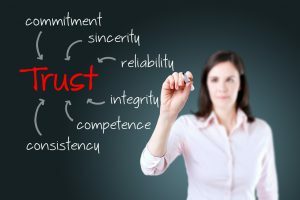 The background problem of people who have issues with trust is selfishness you love someone so much that you feel they should be with you alone, people have been in relationships and at the end of the day become strangers with their friends because their partners want them all to themselves. On the other hand some people have trust issues because of their past. Most people who had cheating partners often find it hard to trust again the minute their new partner exhibit a character their ex possess the thought comes back and they start to doubt their partner. If you have a partner who has trust issues its not time to give up on them it can be worked on and if you are the one that has trust issues don’t feel bad you can get over it. Accept your faults: The first thing to do is to accept your faults because if you don’t accept your faults there is nothing you can do because you can’t wake up a person who is pretending to be asleep. Understand that you have trust issues and you are willing to be a better person. Welcome people around your partner: The truth is we all need people, your partner had friends before he/she met you and the funniest thing is some of you even met your partner through their friends, so you see you don’t have to ask them to throw their friends away. Caution them when it’s getting too much and then I know there are some friends you feel your partner should not keep have a dialogue about them and then make them see reasons why they shouldn’t hang around such people and it should not come from a selfish heart let it be because you want the best for them. Forgive your past: people have hurt you and trust me if you are reading this you are strong. 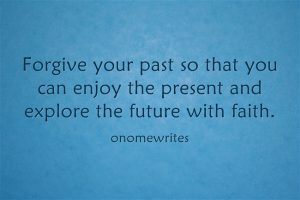 Don’t allow the hurts of your past to control the joy of the present you need to let go. Forgive that your partner that hurt you and move on. If you feel you can’t do it then tell God about it, God is not just a provider of material things He heals hearts and give us real peace that surpasses all human understanding, I’m a living witness to this trust me it works. Everybody is not your ex: just because your ex hurt you does not mean every other person you meet wants to do the same. You need to understand that everybody is not out there to hurt you. Live your life again. Give yourself time: the truth is don’t expect a change overnight you need to understand that trusting people again will take time. If your partner is the one with this issue don’t get mad at them as long as you are seeing little changes don’t give up, they will surely come out better. 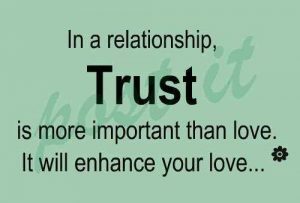 Love is not the only thing you need for a good relationship you need trust not partial trust but complete trust. Love is built on trust. You don’t have to become an FBI agent because you don’t trust your partner. If you have lost a partner because you trusted them don’t feel bad you have become wiser and better. You are a champion don’t stop growing. Thanks dear… Its an honour! You just healed me with this piece. I’m so glad hearing your testimony. Its such an honour. Thank you so much for taking your time to read and commenting and your testimony gives me so much joy. God bless !